An Irish man who spent over four years in prison in Egypt is "absolutely ecstatic" having been released and reunited with his family after his acquittal, his lawyer has said. 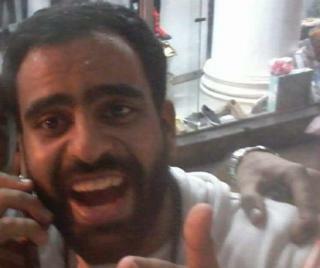 Ibrahim Halawa, who is from Dublin, was arrested during a siege at the Al-Fath mosque in Cairo in 2013. He and 500 others, including his three sisters, were accused of inciting violence, riot and sabotage. The 21-year-old is expected to return to Ireland on Sunday or Monday. He was acquitted of all charges more than a month ago but his his release had been delayed. His sister Somaia said the family is "over the moon" after he was freed on Thursday night. "Yesterday was a day that I can't describe," she said. "I am finally able to continue my life normally - I'm able to laugh without trying to pretend everything is OK when it was not." Darragh Mackin, the family's lawyer, said Mr Halawa had spent four years of his life "in the most difficult and cruel conditions". "Given the fact he's now free, and is to be reunited with his family, friends and education in Ireland, he is absolutely delighted," he added. "I think that's putting it mildly." Irish Foreign Affairs Minister Simon Coveney outlined the formalities surrounding Mr Halawa's return to Dublin in an interview with Irish national broadcaster RTÉ. "We need to get that immigration stamp - in order to do that he needs to turn up in person at the immigration ministry," Mr Coveney said. "That office is not open on a Friday and has very limited opening on a Saturday, so we are obviously working to get him home as quickly as possible. "It will be either Sunday or Monday by the time he is home, I suspect." Ms Halawa credited Mr Coveney and Irish Prime Minister Leo Varadkar for their support in the campaign for her brother's release and providing a "different tune" from the Irish government. "There was always private messages, supportive messages," she said. "I think this had played a huge role to make us believe that we finally had a government that really believes that Ibrahim was innocent and worked so hard towards getting him released." The relationship between the family and the Irish government was "turbulent" at times, according to Mr Mackin. But he added: "The reality is it was that constructive relationship and it was that that has resulted in Ibrahim being fast-tracked in his return home. "The diplomacy cannot be understated - when it mattered most, the Irish government has assisted in ensuring that Ibrahim has been returned home." Ms Halawa said she would never go back to Egypt - where some of her relatives live - even though she, her sisters and her brother have been acquitted of the charges against them.